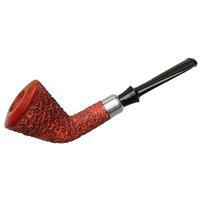 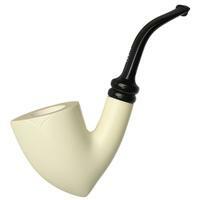 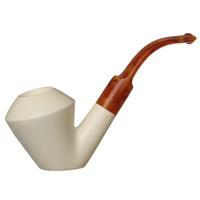 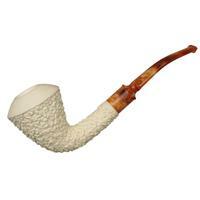 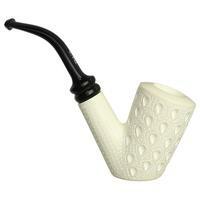 Rendering a Cherrywood from meerschaum is a balancing act of sorts. 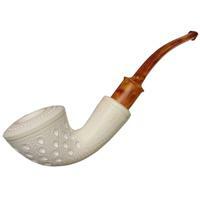 The benefits are the natural beauty of the material itself (pale when new and developing warmth and color with enjoyment), the attractive qualities of the sort of detailed carving commonly applied to this medium (dot and latticework here), and of course meerschaum's remarkable ability to be impervious to burnout. 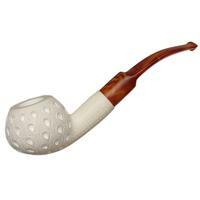 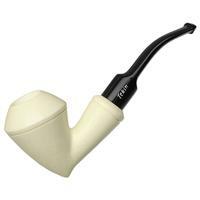 The risks is that without some drastic alterations away from the classic form or use of an exceptionally dense block, a Cherrywood of meerschaum is unlikely to sit; the bowl will just be too light. 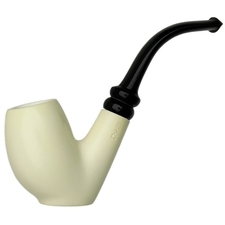 Lucky for you, this one is perfectly balanced and perfect for sitting on a flat surface when not in use. 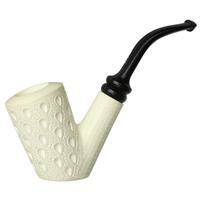 Splendid work from Tekin.